THE BLACK WARDROBE's blog: Gothic hairstyles, can curly hair look good with your gothic outfit? I think curly hair can be gothic, but it has to be dark hair. What about Vampire Lestat, he has very curly hair. Wow, I am not feeling the curly love here! I am an elder goth with long curly hair. Admitedly I didn't learn how to work with it until I was in my late twenties, but now I get compliments on it all the time - on the street and in the club. Sometimes it is auburn and sometimes it is RED, but always it is beautiful! And, lastly, part of goth is not following the crowd. Seems like pin straight dark hair is following the crowd to me. I learned to love my hair at naturallycurly . com. well, curly hair is very elegant, so it really depends. What kind of goth are you? For instance, Victorian goth-would look excellent with curly hair. romantic goth- would look with braided or wavy hair. 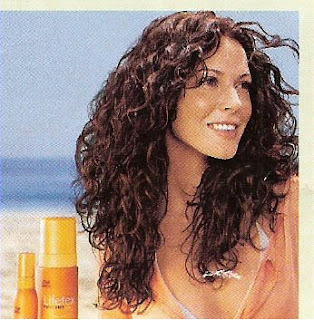 I have curly hair, and it's like frizzy and poofy and it looks absolutely scrumptious with almost everything I wear. Hi Serena! I am not a Goth! although I love Gothic. I tend to go for the Vamp vintage look. I used to be addicted to straightners and have my hair dead straight like a raven but I got bored of the Mona lisa look. I tend to go for something more romantic and girly nowadays. I love waves. They don't make the hair look liveless and flat and they are easier to control than proper curls. I really think any colour curly hair can often be more gothic than straight black hair. Besides, no need to be so hard on Bonham Carter. It's exactly her trampiness that contrubutes to her gothic look. I like her as Bellatrix in HP, and I'm sure she's got more admirers. I think that curly hair can look gothic. My hair is very curly and some styles I wear it in look really gothic. I also used to be a hair straightening addict but straightening my hair always gave me loads of split ends and my hair went really dry and horrible. Lately I've been getting loads of compliments on my hair and I'm really learning to love it. 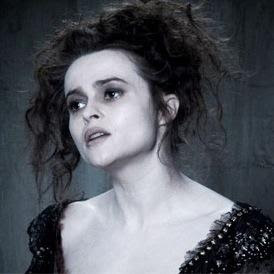 Oh and I love Helena bonham carter. She is really unique and beautiful she's great in Sweeney Todd her hair is amazing! Goth is a state of being and as a result curly hair etc is perfectly acceptable. Goth is who you are, not what seems to look like it. As for the 'curly blond locks of angels, that is a cherub not an adult angel. I think that the makeup does all, so you can have any color of your hair. It is true that darker colors have more impact. I just love curly hair. You basically just said that no one of color can be Goth. I have curly hair and I wear it in victorian styles. As for other types of Goth, I don't see how curly hair could possibly look disorganized. It all depends on what look you are going for to begin with. You also lack good examples of curly hair styles that aren't so stereotyical. I believe Goth is what you make it. Not all Goths are white with curly hair, and not all Goths are willing to damage their hair to obtain a constant strait look.